Raja Laut is a modern incarnation of a 19th century trading schooner, the type of vessel that sailed from Europe and North America to join the spice trade in theIndonesian and Malay Archipelagos. Strategically located between East and West, with it's geography of thousands of islands, and a rich bounty in spices, this vast archipelago was then, and remains today, a cultural melting pot of flourishing entrepots, port cities, and ancient kingdoms. The name "Raja Laut" means "King of the Seas" in Malay. "Raja" (itself a derivation of the hindustani for king) was an honorific title used in ancient times from Srivijaya to Malacca, Makassar to Ambon. 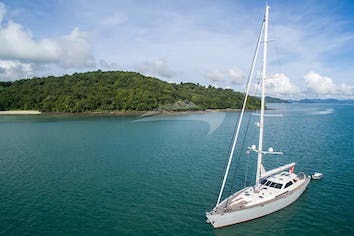 Asia’s geography, climate, logistics and infrastructure present its own unique challenges, and with this in mind, the Raja Laut was designed with the specific requirements for high end yacht charter in South East Asia. Raja Laut’s interior spaces are built from selected tropical hardwoods, and accommodate 12 guests in 6 cabins, each features an en­suite bathroom (3 double bed cabins, and 3 twin bed cabins) with air­-conditioning throughout. The exterior of the yacht features a stunning teak deck, with multiple beds for sunbathing or lounging, both in the sun and under shade, and a central dining table, where meals are served alfresco under a large awning. Raja Laut’s fuel, water, and food storage capacities and well-proportioned motorisation becomes important for expeditions in remote tropical areas. Operating since 2006, we take pride to deliver itineraries, developed over a decade of hands­ on experience, while always presenting the opportunity for surprises,explorations, extraordinary moments, simple pleasures, human connections, and unforgettable emotions. 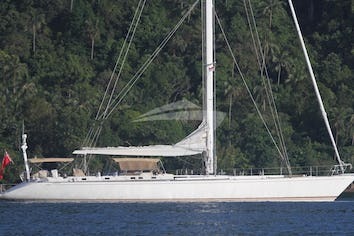 RAJA LAUT can accommodate 12 guests in 6 cabins. The Master cabin has a king size bed, shower and toilet. 3 Guest cabins have a twin bed, shower and toilet. 2 Guest cabins have a king size bed, shower and toilet. 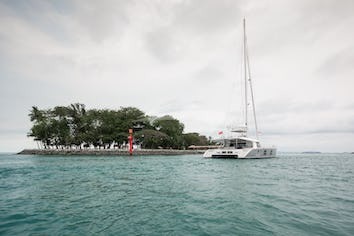 RAJA LAUT is fully air conditioned through out. Crew has a separate companionway, heads and shower.